Watch full One Piece Season 15 Episode 26 English Subbed full HD online. One Piece Episode 542 English Subbed online for free in HD. On an unnamed island, Toriko and Komatsu catch and defeat a Harusame. 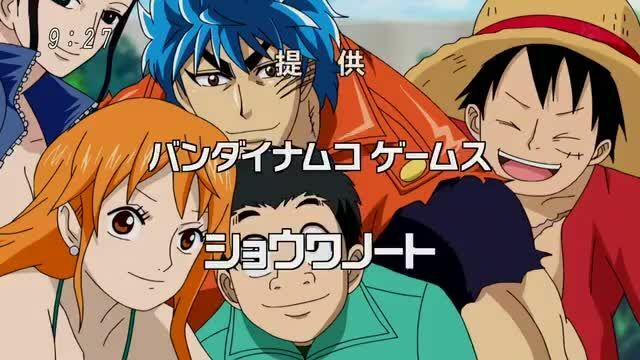 Luffy comes out of the Harusame’s mouth and meets Toriko and Komatsu once again. However, the Thousand Sunny arrives and Toriko and Komatsu find out that Chopper is sick. They decide to find the Seafood Fruit and make Chopper eat it to heal the reindeer. Luffy, Toriko and the Straw Hats head off to To-Chuka Island to find the fruit. 4 / 5 - 41 ratings.